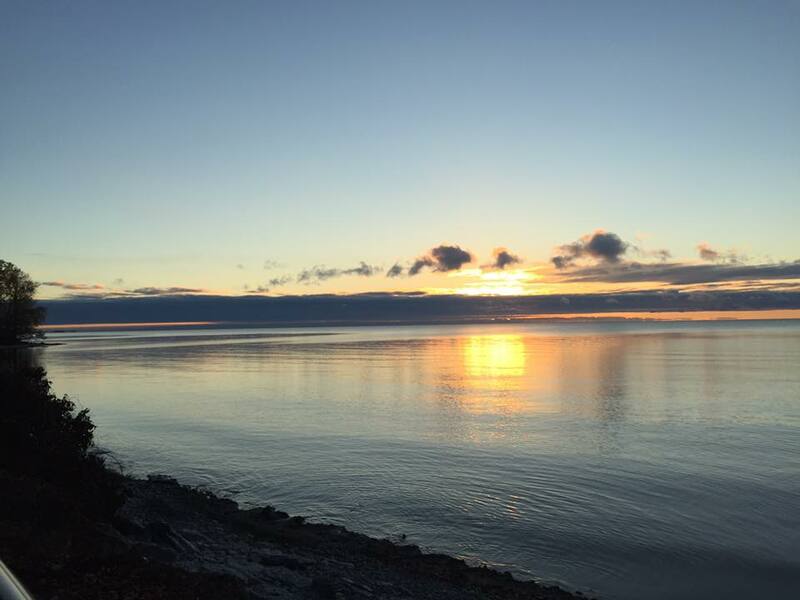 Photo: Dawn in the ‘county — Cressy Lakeside Dr.
Photo: There’s no place in Ontario that calls to my soul quite like Prince Edward Co., and it’s views like these that keep me coming back for more as often as I can. 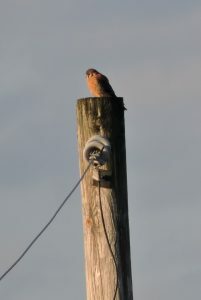 Photo: As I took to a narrow side rd., I noticed this Eastern (borealis) Red-tailed Hawk perched on a fence post right near the side of the road. Photo: Horned Grebes were a common fixture close by to Long Point Rd., just outside of Prince Edward Point N.W.A. 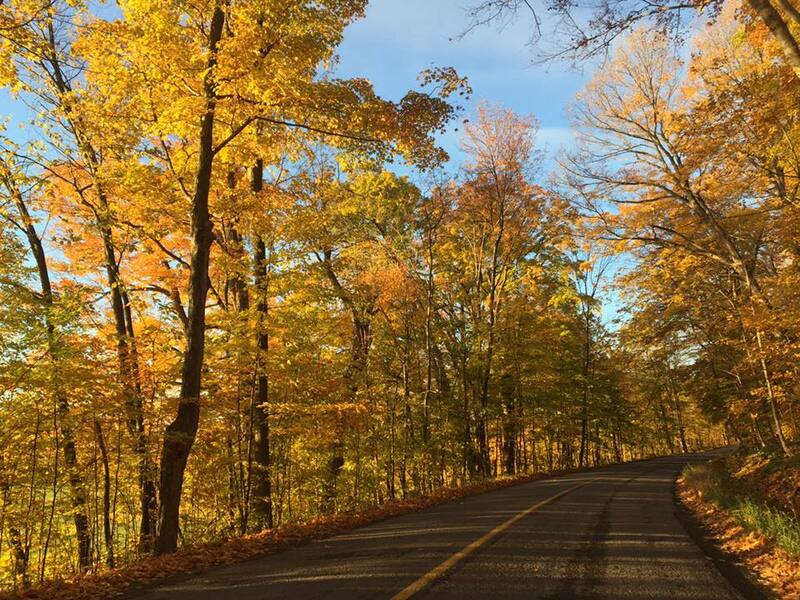 Early-mid November is this species’ peak migration window here. I tallied them all throughout the ‘county, with a high count of 23 seen looking W and S from the tip of Lake Shore Lodge Rd. 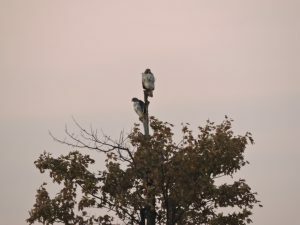 Photo: Red-shouldered Hawk at left and Red-tailed Hawk at right. 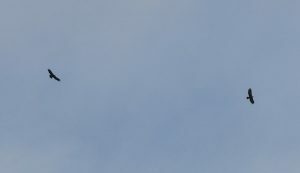 Upon arriving at Point Petre Wildlife Area, I noticed many raptors migrating above. 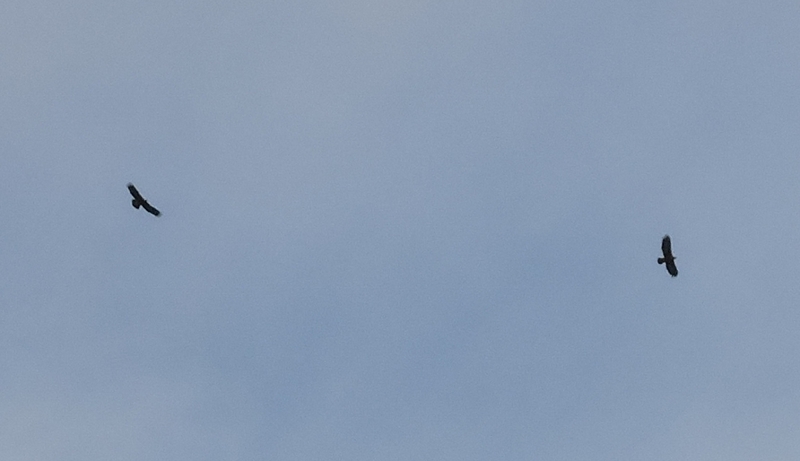 These two birds were photographed in the same frame but for the sake of comparison I cropped them to compare them. Note the buffy area to the outer wing in the shape of a spur or crescent and note also the relatively squared-off hand (primary tips). 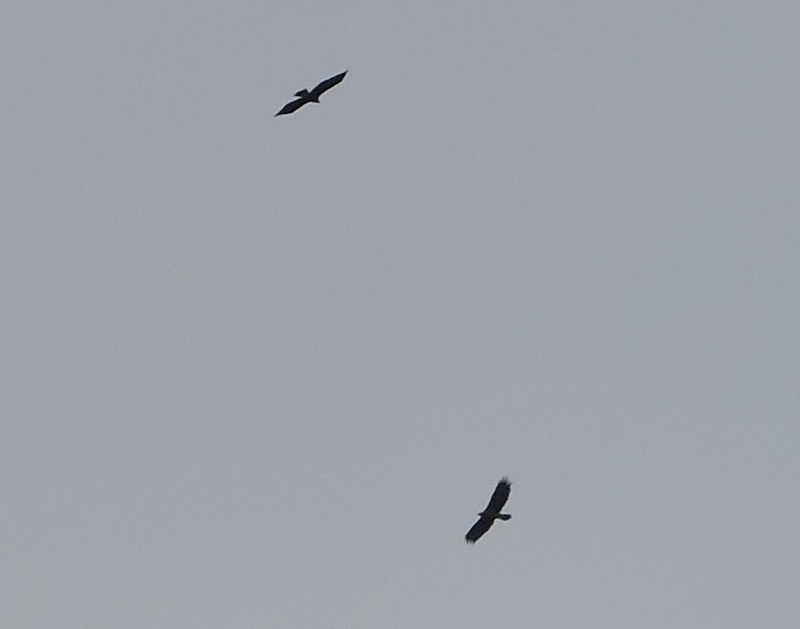 With the Red-tailed at right, note the translucent “window” (vs. crescent) to the outer primaries. 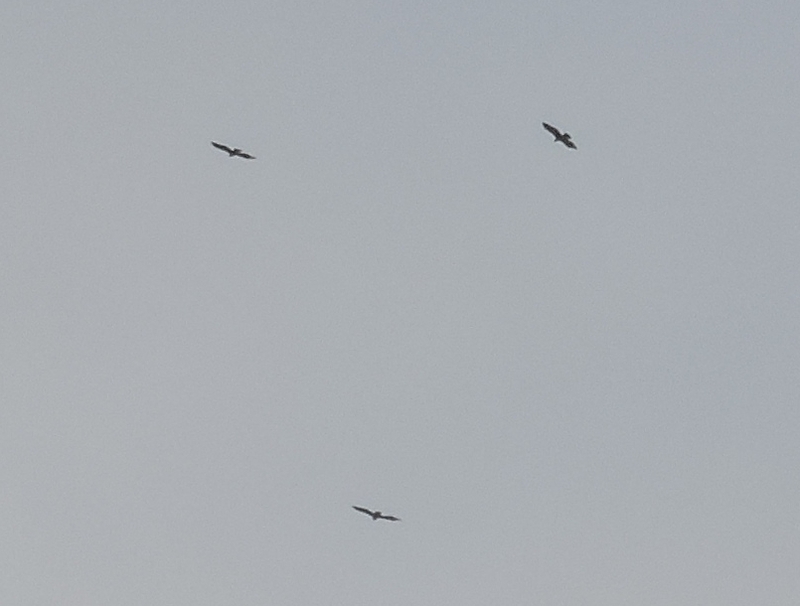 Photo: I began to slowly vertically zig-zag across the horizon in search of other raptors and was flabbergasted at what I saw next: a kettle (migrant flock of raptors) of eagles comprised of 4 Golden and 1 Bald! I began to try to get the group in focus but they were very far away and by the time I could finally find a spec in my viewfinder, one Golden along with the Bald began to drift apart from the other Goldens. I let that go and focused on trying to get shots of the 3 Goldens in profile. 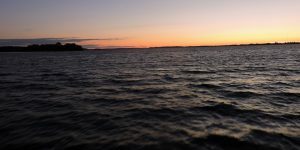 Below is my series of photos. With Goldens, they are truly beautifully proportioned; they are built powerfully but with a distinctly lean, athletic feel — like an international-class 800 m runner. The head and bill are relatively small on the body and at a distance, this really shines through in the form of a small head profile jutting forward from the body. The tail is long on the body. The shape of the wings are also telltale: lobed at the secondaries and ‘pinched’ in width at the body. This creates a lovely sinuous trailing edge which can be appreciated/discerned at many angles. The wings are typically held at a shallow dihedral. Photo: Note the curvaceous trailing edge to the bird at top and the proportionately small head and long tail to the bird at bottom. 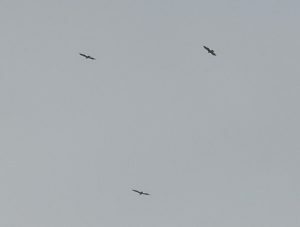 Photo: With slow, broad circles high above in the ether, they lit my birding soul aflame! Photo: A pair of Red-tails at dawn. Photo: Early on, I encountered a small group of about 20 Canada Geese and thought to check them “just in case” something was in with them. 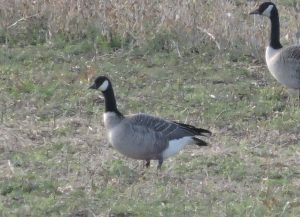 Turns out two Richardson’s (hutchinsii) Cackling Geese were. 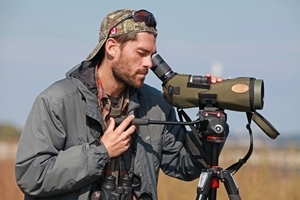 Note the tiny, blocky (steep forehead often with a light peak to rear of head) heads and the palpably short, deep-based bills on the Cackling compared to the ‘door stop’ head profile to the Canada Goose with them. Photo: A male American Kestrel perch-hunts from atop of pole. One of three kestrels seen on the island today. Photo: Several characters shine through on this Richardson’s (hutchinsii) Cackling Goose. Note the short “reach”, with the head and neck almost perfectly vertical while foraging. The short neck lacking a ‘hump’ at the rear (“excess” neck as seen with Canada Geese) is another field mark of note. Also, check out the pale breast and pale upperparts and also the broad pale fringing (emarginations) along the upperside. Photo: A comparative photo showcasing the excess neck and more forward-reaching foraging posture typical of Canada Geese compared to the Cackling below. Note that both birds are rather silvery and pale, with the Cackling showing higher contrast to its upperparts; a look derived from the broad, pale emarginations lending to its “scaly” look. 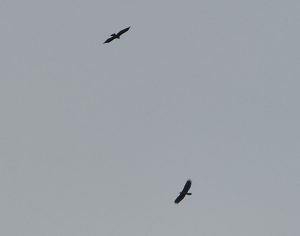 Photo: Same bird as above. 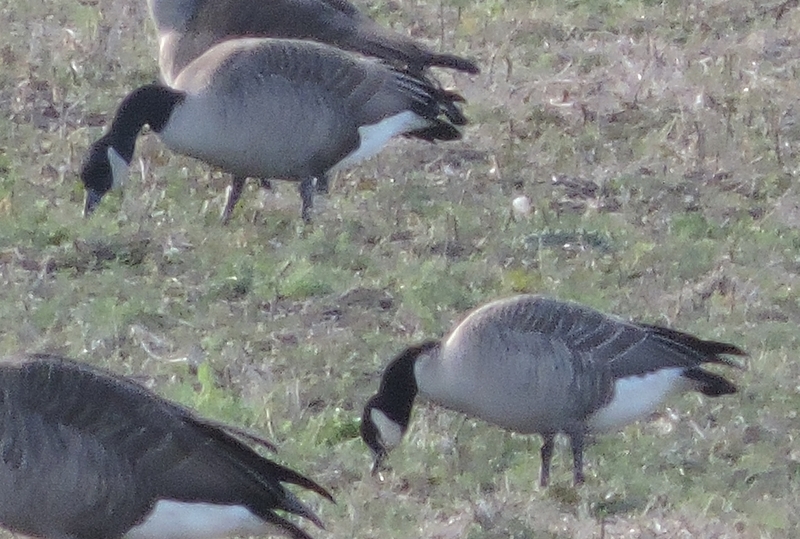 Proportionately, the skull looks tiny on this otherwise rather large hutchinsii Cackling Goose. Photo: A nice welcome from switching gears from the fields to the waterway: a female Common Merganser swims very close to shore along Hwy 96. I took this photo through my closed passenger side window. Photo: A shoal full of Tundra Swans :). I counted 70 during a slow sweep with my scope. 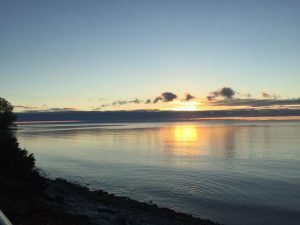 Come early November, Tundra Swans are a common fixture at Wolfe Island. 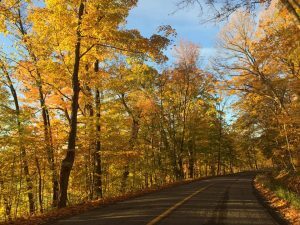 Here, numbers typically rise throughout November, typically peaking from approximately the 3rd to the 4th week of the month. Photo: While driving, brown sparrows (i.e. not Dark-eyed Juncos) flushed from the road. I stepped out and began to spish and up popped two immature White-crowned Sparrow, one White-throated, three Song Sparrow and a single Chipping! 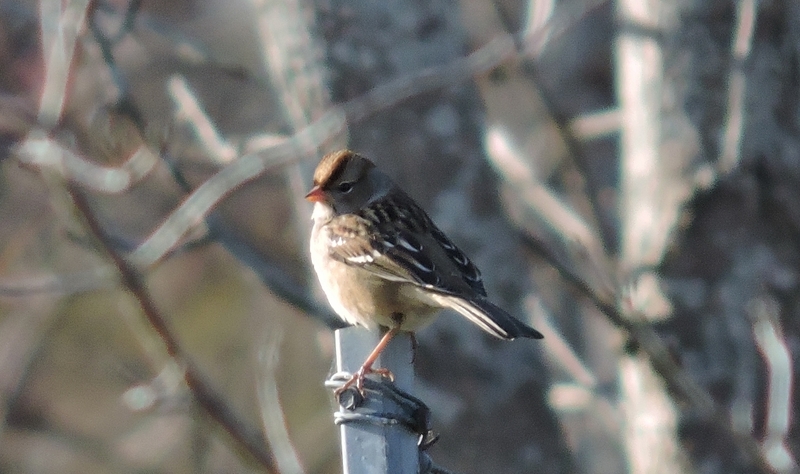 This is an immature White-crowned Sparrow. Photo: A winter Chipping Sparrow. A little further up the road I flushed two very dark brown, short-tailed sparrows. They montarily lighted on the tips of shrubs and I managed to confirm my gut impression: Savannah Sparrows for the day list. They were very skittish and evaded my lens with ease. Photo: Four of five juvenile Black-bellied Plovers resting on the rocks in Reed’s Bay. Photo: Chimp chimp…..chimp chimp goes the Winter Wren. This species’ call note is quite similar to that of a Song Sparrow only the notes are delivered as paired sequences. 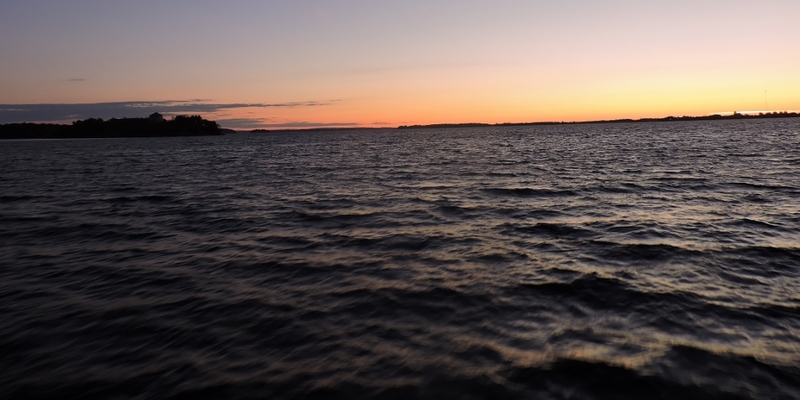 Manual mode for the win? Er. Photo: A rather uncommon find in these parts: a Northern Mockingbird. I flushed this one near the parking lot at Big Sandy Bay. I took two photos then left it be. It’s possible other birders in the area may find this one of interest so I hope it stays put! Photo: Ah yes, that sweet look of those long broad wings, lightly-built body and long tail. 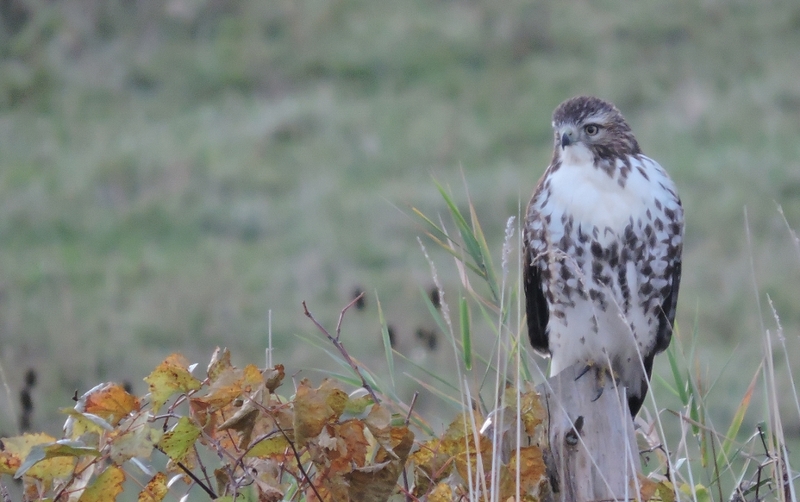 A bird built for life on the wing: Rough-legged Hawk. I fall into a trance-like state watching their effortless, billowing wing beats as these birds course over open country in search of voles. Photo: The dark swath across the belly and the dark patches to the outer wing are useful features to look for; these are called carpal (wrist) patches. Once I began to see Rough-legs as truly lanky Buteos and as slightly more muscular versions of Northern Harriers, the final vestiges of “is that distant bird a Red-tail or a Rough-leg?” question faded from my birding brain..
Photo: Greater Scaup — a classic Lake Ontario Ontario bay duck in late fall – early winter. 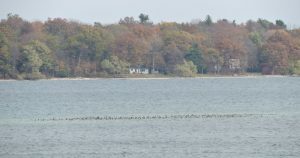 Numbers of Greater Scaup increase throughout November along the north shore of Lake Ontario with rafts by the thousands seen in places like Amherst Island, Wolfe Island and especially Prince Edward Point N.W.A. Photo: A classically-shaped raft of Greater Scaup foraging in the deep, open waters offshore Wolfe Island.